Last year was a fantastic year for the NESPS starting with a very successful Annual Meeting in Newport, Rhode Island. Thanks to our Past President, Dr. Jeffery Ascherman and our Program Chair, Christine Rhode, the program was an academic and financial success. Our meeting was well attended with numerous fantastic panels, guest lecturers, and scientific presentations. The President's Run was a huge success with many teams competing and enjoying the run along the beach. 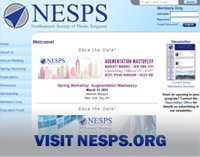 More recently, we had our 2nd Annual NESPS Spring Symposium in New York City. The symposium on Peri-Orbital and Forehead Rejuvenation at the Lotte New York Palace Hotel was also very well attended and well received. I had the honor to be the Chairman of the meeting and am indebted to Dr. David Otterburn, the Program Chair, PRRI our management company, and our esteemed faculty Drs. Alan Matarasso, Henry Spinelli, Richard Warren, Glenn Jelks, Charlie Thorne, David Hidalgo, Craig Dufrense, and Richard Lisman. We look forward to our 3rd Annual NESPS Spring Symposium (March 2, 2019 at the Lotte New York Palace Hotel). This symposium will cover all aspects of Rhinoplasty and be chaired by Dr. Peter Taub (President-Elect, NESPS) and Dr. David Otterburn (Program Chair). Drs. Taub and Otterburn have worked very hard to organize this program and have already confirmed participation by many acclaimed faculty (including Alan Matarasso, Mark Sultan, Steven Baker, Mark Constantian, Edmund Kwan, Jess Ting, and Peter Taub). We look forward to finalizing the program and hope that you will join us at this exciting event. Space will be limited so please reserve your spot! The 35th Annual Meeting of the NESPS will take place on October 26-28 at the Renaissance Hotel Boston, MA. I have had the pleasure of working together with Dr. Evan Matros, our Program Chair, and we have put together an exciting program. The venue is a five-star water front hotel located minutes from downtown Boston and Cambridge. The program includes many exciting panels including Breast Reconstruction: Pre-Pectoral vs. Retropectoral Breast Reconstruction; Neck and Male Rejuvenation, Pros and Cons of Sub Specialization and Fellowship Training for Residents; Transgender Surgery, Practice Management Hot Topics with a Focus on Social Media and Reputation Management, Improving Abdominal Wall Contour in DIEP Surgery, Abdominoplasty, and Total Body Lift. We are indebted to our esteemed panelists who promise to deliver exciting and engaging presentations. The Eugene Courtiss Memorial Lecture this year will be delivered by Karl-Heinz Breuing, MD. Dr. R. Barret Noone will deliver our Founders Address and Dr. Arin Green will deliver the Residents Best Paper Award Alumni Lecture. The Member luncheon and Annual Business Meeting will be on Friday, October 26 at 12:30pm and the President’s Reception and Banquet will take place on Saturday, October 27. We are excited also to have our first annual NESPS Women in Plastic Surgery Luncheon on Saturday, October 27. I look forward to seeing you at our Annual Meeting!